As of today, I’m excited to announce that I am officially looking for a handful of beta testers for Mayer. 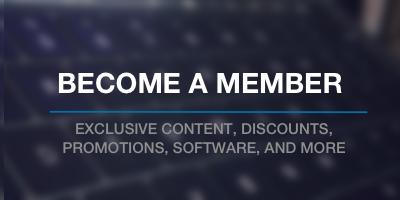 Mayer is for bloggers who write frequently and/or write long form content, or want to do either of the above. It offers no options – everything is managed via the Theme Customizer. But, as they say, I’m too close to the product, and so I need to get it into the hands of others who are willing to install it, toy around with it, try to break it, and report bugs, and other mistakes, and who are willing to do so for a number of rounds of testing. If this sounds like something you’re interested in doing, then please read on as I’ve got all the details below. 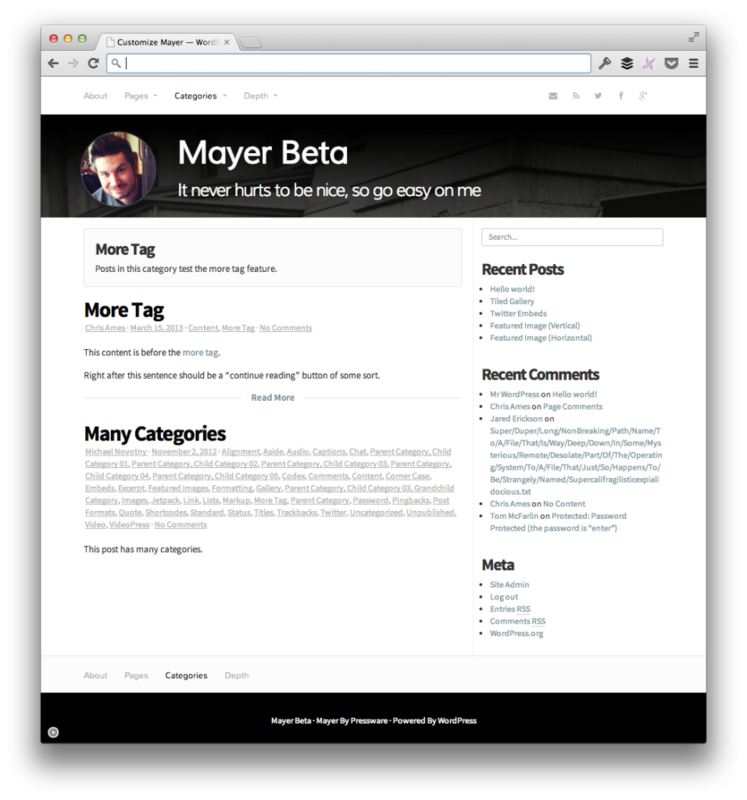 The first thing to note about Mayer is that I’ve built this theme for myself. As mentioned, I’m going to be using this before it reaches 1.0 – I heavily believe in dog fooding your own work. To that end, I’ve built this theme for me and for people who are already established, frequent, long form bloggers, as well as for those who aspire to be. As far as the theme is concerned, it’s meant to stay out of your way so that you can write. It’s got a single sidebar, customizable menu, a few social icons, a few customizable colors, and support for some of the latest features in WordPress 3.8 as well as a couple of well-known plugins, and more. Everything is managed via the WordPress Theme Customizer such that when you click Activate, you’re ready to write. No theme options. No fancy menu items. No buttons to press. No drop-downs to select. Just write. The thing is, I need testers. At the risk of sounding cliche (and because I’ve been building it not only for my own personal use, but because I’ve been working on this on the last few months), I’m unable to see the forest through the trees. To that end, I have several rounds of beta testing planned each with their own requirements, and I’m ready to begin testing as soon as I have a team. Want To Help Beta Test? So here’s the deal: I am currently looking for 15 beta testers. And when I say beta testers, I’m not talking about people who want free access to an upcoming WordPress theme. That isn’t what beta testing is about. I’m looking for people who are going to try to break the thing in as many ways possible, as well as offer quality feedback. Who are self-starters. No one likes to babysit, and I don’t want to have to prompt you guys and gals to test the thing. I’d rather we all bang on the thing and share our findings with one another. Who genuinely care about WordPress, blogging, and who see writing as a craft, of sorts. If you’re still interested, them please shoot me an email. I’ll have a few more questions for you via email. Once I hear back from enough of you, I’ll let you know if you’re in or not (as well as why). Once I’ve got the 15 that I need, we’ll get started. I’m looking to officially begin testing this Friday, January 10th, 2013. No one likes to work for free (and I certainly don’t like asking people to do so! ); however, I also recognize that I’m asking people to volunteer for testing. So here’s what we’re going to do: Once the beta testing team has been selected, we’re all going to have a backchannel setup where we are able to hang out and chat during the day. If not, then don’t apply, or make some suggestions! I’m completely open to that. In fact, you don’t need to be a designer, or even an extraordinarily active blogger: I’m simply looking for people who are capable of viewing a theme in a variety of web browsers, who are comfortable with WordPress, and who are looking to blog even more than they already do (whatever that may look like for you). I don’t care if you’ve ever written a line of code in your life, nor do I care if you’ve ever designed something. Though having technical experience won’t hurt, it’s not required. This is a theme for writers. I need people who are willing to test the theme from an author’s (and a power user’s) perspective. Okay, that should cover everything. If you’re still interested, then please shoot me an email with why I should select you as part of the beta testing team, and I’ll be sure to get back to you ASAP. I’m looking to have the team assembled no later than the end of this week (that is, the week of January 6th) so that we can begin testing as soon as possible. Comments are closed on this post. I'd prefer all responses to be sent via email. Thanks!